“The day I drove home with my new hearing aids it was raining. 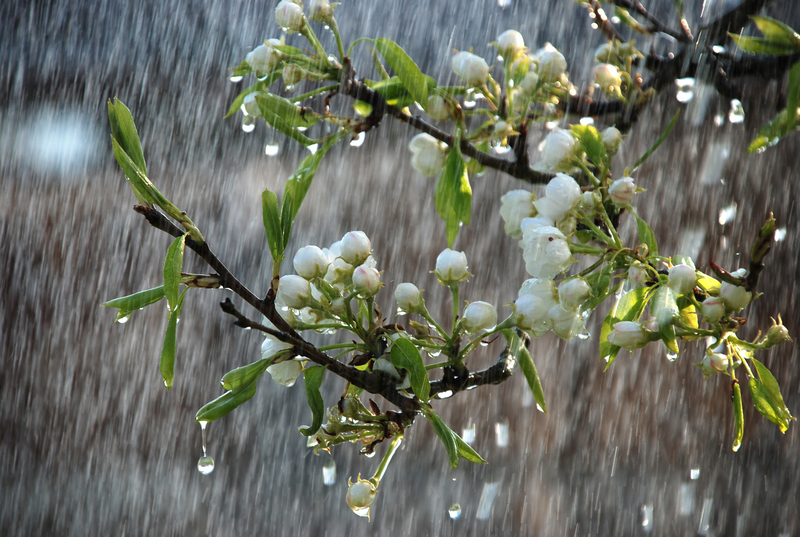 I heard the beautiful sounds of raindrops dancing on my roof. I could not believe how much I had been missing. I could hear the tires going through the water on the road and it was like a symphony! The sounds were clear and crisp. These hearing aids have opened a beautiful and expanded world to me.” – Robert Ayers, Groton, CT, Audibel wearer. First time hearing aid wearers are often astounded with all the sounds they hear again. Spring, in particular, is full these lively sounds of rejuvenation. Birds chirping, children playing outside and, of course, rain showers. As so eloquently described by Mr. Ayer’s above, these simplest of sounds can sound like a symphony when heard together. There truly isn’t a better time of year to enjoy better hearing. Your hearing remains our concern and the Audibel network of hearing professionals would love to help you fully experience the sounds of Spring. These comments shared by Robert and Brenda on a couple of many we have received that depict really how precious are hearing is in our everyday lives. If you or a loved one is interested in learning more simply contact us or a network hearing professional on our locator page. For many, the decision to begin using hearing aids is both an exciting and nerving one. After noticing the signs and effects of hearing loss, the benefits of pursuing a hearing aid usually becomes very evident. Yet, when evaluating hearing aids for the first time, the common misperception is that they will fully restore lost hearing abilities. However, this expectation is not always met. 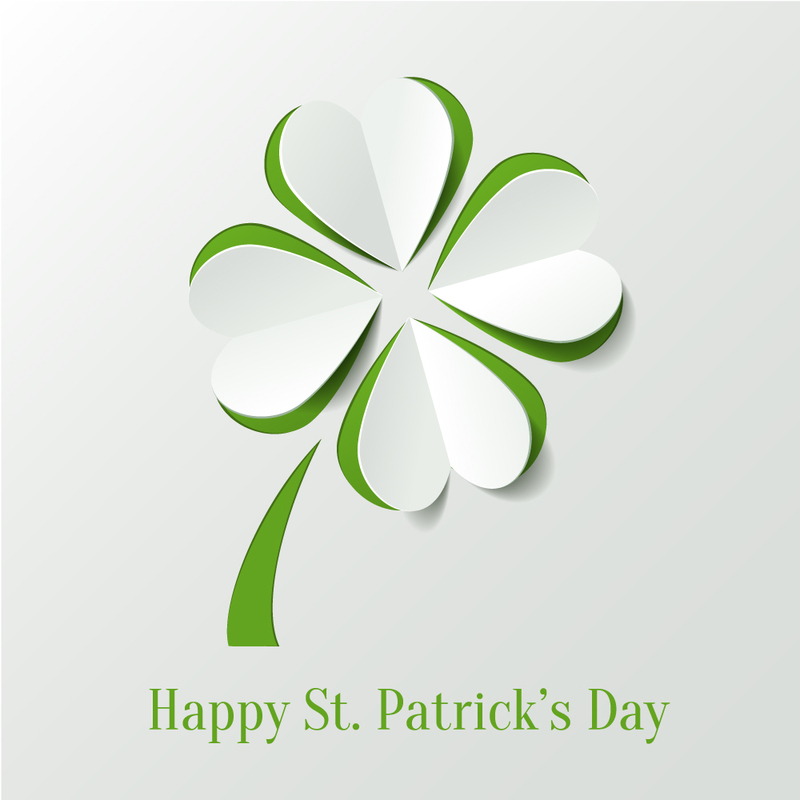 Around this St. Patrick’s Day we wanted to illustrate the steps required in achieving better hearing, rather than just letting first-time users to rely on good luck. The reason a hearing aid can’t fully restore hearing abilities is actually due to the way in which our brain processes sounds. When someone has untreated hearing loss for an extensive period of time, the brain eventually forgets how to process and recognize certain syllables or words that may have gone unheard. While today’s hearing aids are designed to make the amplification of sounds clear and comfortable, even in noisier environments, they do not always help the user with full speech comprehension. To regain speech comprehension, the brain requires time to adjust to new sounds as well as practice in listening. Our MyAudibel program offers fun and interactive hearing games that provide a perfect opportunity to practice speech comprehension with hearing aids. These games are designed to help those who have made the smart investment in hearing aids to get the most of them. Your hearing is our concern. We want to be with you at every step in the journey to better hearing to ensure you get the optimal listening benefits. At Audibel, we are always looking for ways to improve on the hearing aid solutions and patient care experience we provide for each patient. We thrive on the motto of our network Founder, Bill Austin, to be “better today than yesterday, better tomorrow than today”. As a part of this relentless effort to deliver better patient outcomes, the Audibel network of hearing professionals regularly convenes for in-depth training on new products and patient programs. 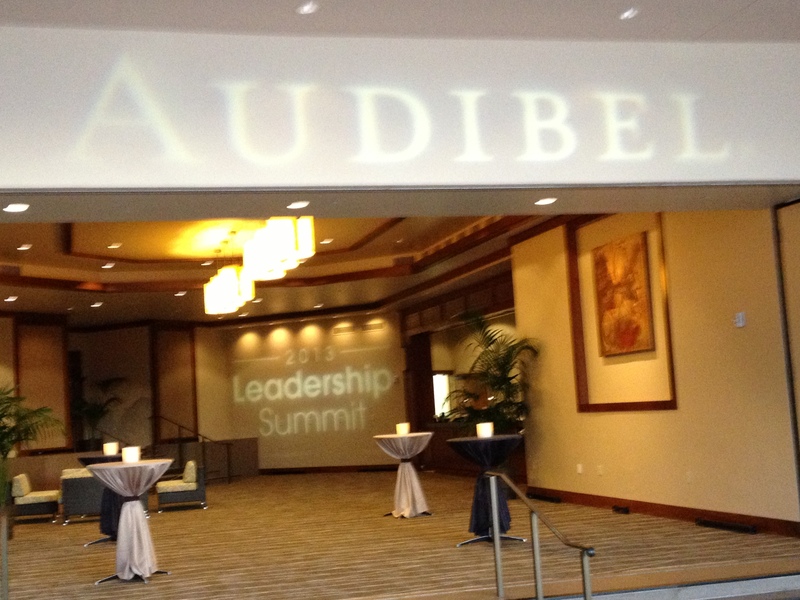 Recently, the 2013 Leadership Summit took place to introduce and train Audibel providers on the new tinnitus management device, the MyAudibel personalized patient websites and much more. This three day training offered our partnering hearing professionals a chance to improve their skills and offerings to start the New Year. Also, it gave all an opportunity to share their successes in patient care amongst the network and learn from each other’s’ experiences. We are confident in our abilities today and are committed to bettering ourselves in the future. We hope these extra efforts are evident to our patients by providing the best hearing care experience for anyone who walks into an Audibel office. We are ready to help you or a loved one with better hearing in 2013. With every New Year’s celebration we make a firm pact with ourselves to make the coming year one of better habits as it relates to diet and health. 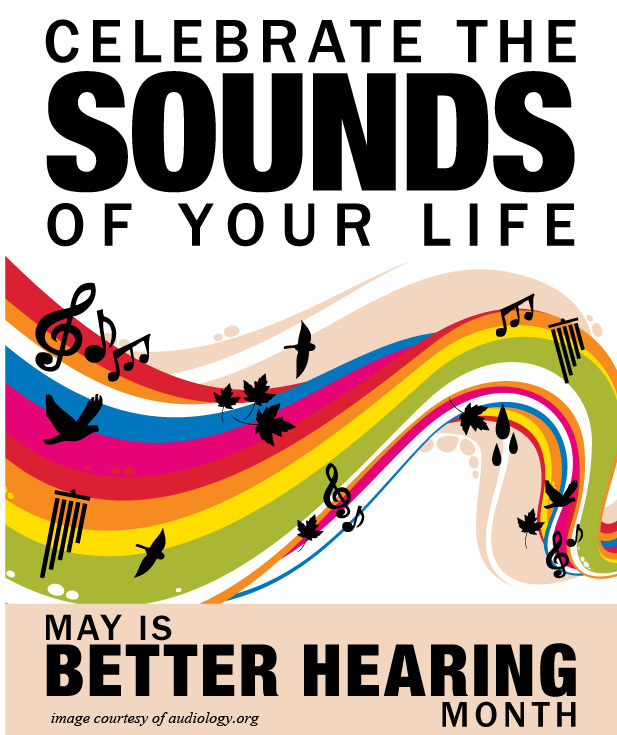 How often have you considered recapturing the sounds that you may be missing due to hearing loss? This coming year, the Audibel network of hearing professionals is committed more than ever to helping those in need of hearing care experience the fullest benefit of better hearing. As a part of this effort, we are releasing new products and programs to reach all of those who are suffering from hearing loss or ringing in the ears. This January, we are excited to announce the release of our Audibel A2 Tinnitus management device. Nearly 50 million American suffer from a condition called tinnitus, commonly referred to as ringing in the ears, and this product is designed to help provide relief for the persistent ringing that these many individuals cope with on a daily basis. Look for much more information on this product on our website and network Facebook page on this product. Also, we are promoting a free program called MyAudibel to all patients wearing Audibel hearing aids, regardless of cost of purchase. This program offers each patient a personalized website with insights into use and care for their hearing aids as well as access to interactive hearing games. These hearing games are a form of aural rehabilitation, or physical therapy for your ears. The goal is to not only give all new hearing aid users practice adjusting to their devices, but also to offer a means to relearn how to hear a lot of the speech sounds that may not have been heard for years before purchasing hearing aids. To learn more about MyAudibel watch this video demonstration here . The Audibel network of hearing professionals is committed to making 2013 a year in which no one suffering from tinnitus or struggling with hearing loss goes without help. If you or someone you know is in need of a hearing professional for a free hearing screening, simply visit our professional locator page at this link. This Thanksgiving, we are thankful for those who have shared their successes of better hearing to inspire us and, more importnatly, inspire others in need of hearing care guidance. These stories help us all reach those who may struggle in everyday situations, like Janie describes below, take the action to get the hearing care they deserve. As a provider of advanced hearing aid technology and a partner network of hearing professsionals, our purpose is to provide individuals with better hearing. These success stories make all the difference to the employees of Audibel and the partnering network hearing professionals. I am not someone who gives testimonials about products but am compelled to offer one about your hearing aids, my local professional, his office staff, and the difference being able to hear clearly has made in my life. I worked at a call center here in Panama City and considered myself a fairly social person but found myself avoiding people and transfering calls that I should have been able to handle due to a hearing loss that I was too ashamed to admit that I had. The “family” at the local Audibel dealer here in Panama City made me realize that my hearing loss was not something to be ashamed of and was something that they could resolve. The hearing aids, advise, patience, and care that I received have changed my life. I no longer avoid people because I am now able to hear them clearly and I am able to tackle any incoming call with comfort and complete understanding. The ability to hear clearly is so very important and I know what a difference it can make in the way you live your life. 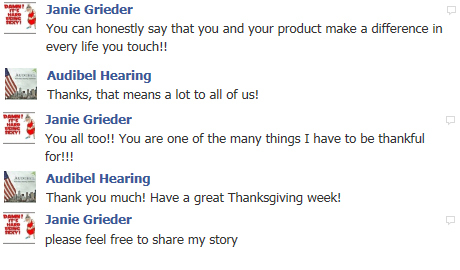 You all have blessed me with the gift of hearing and I give thanks to you all each and every time I proudly wear them.